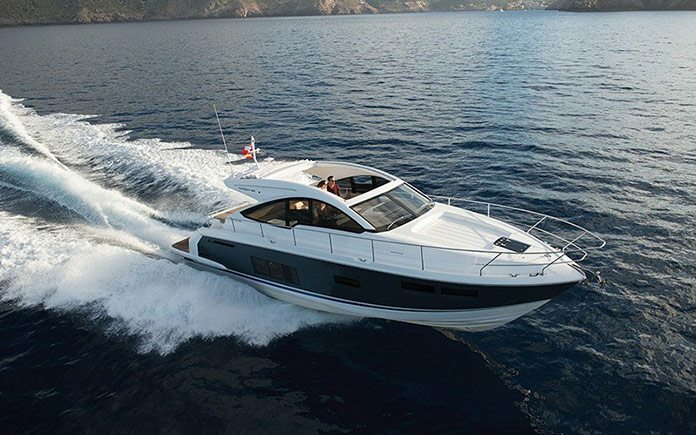 The Fairline Targa 48 OPEN is a beautifully appointed twin cabin, double en suite model that is designed to be the perfect choice for those who favour free-flowing sociable areas both inside and out. 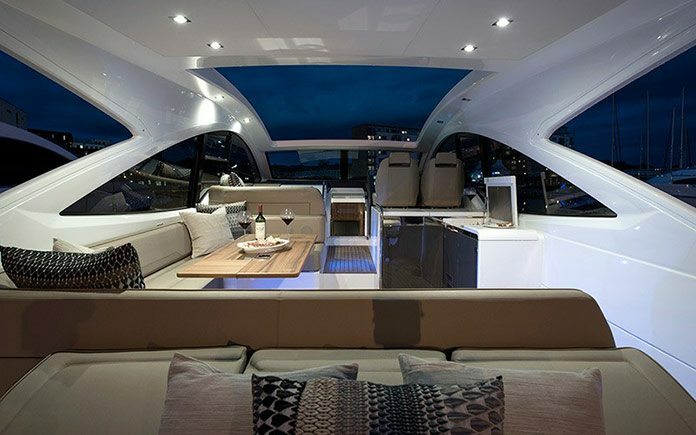 This is further enhanced when the electric canvas roof is open to the skies above. 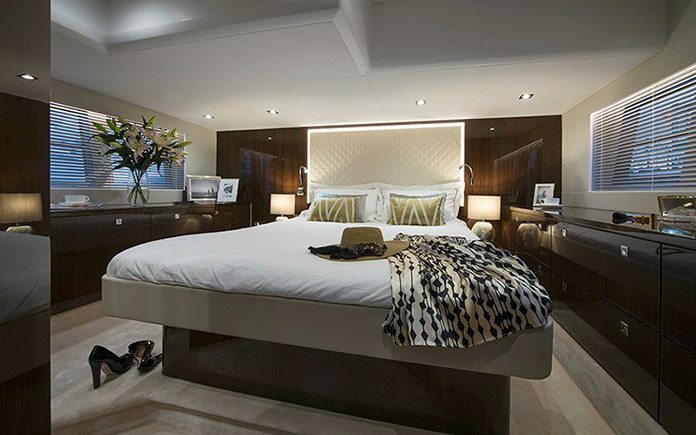 Accommodation below deck includes a mid master and a forward double, with V-berth conversion, as well as a galley with full-height fridge/freezer and spacious saloon/dinette with optional sofa bed or third cabin. 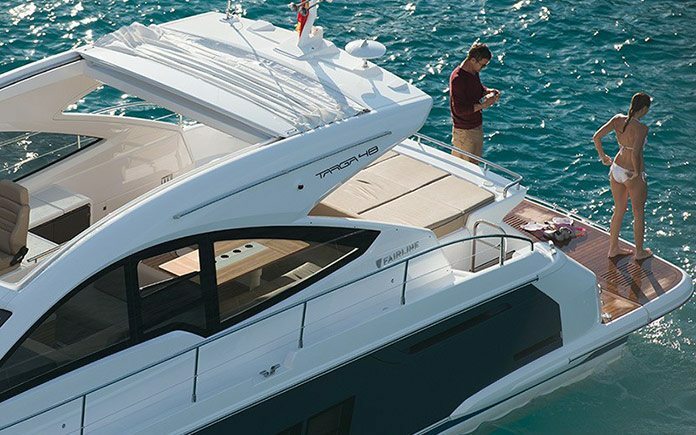 To help you enjoy your surroundings, there’s a garage for an optional jet tender and a submersible bathing platform. 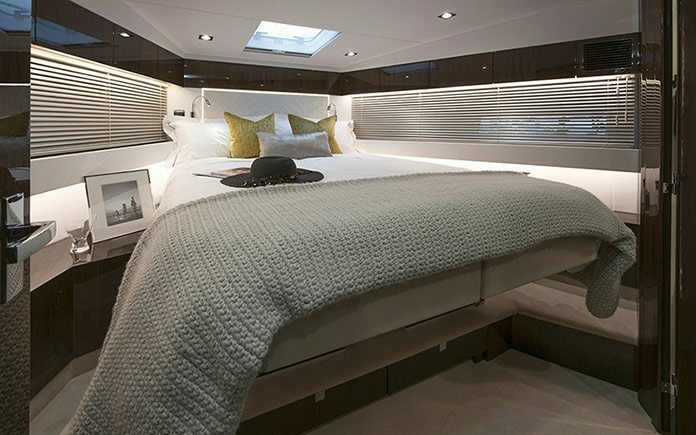 The neutral Capri scheme was chosen by the owner for the interior of the boat, because it offers an elegant, muted palette featuring soothing taupe, white and cream colourways with duck egg blue hues, accentuating the feeling of space of the Targa 48 OPEN. 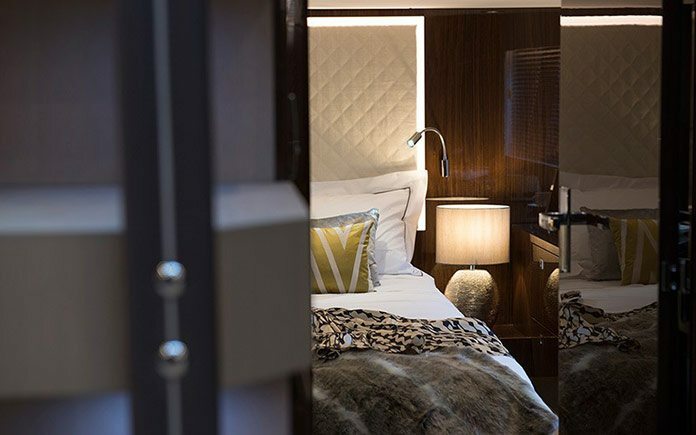 The new look interior makes an impact on the boat’s ambience, which is further enhanced by gloss veneers replacing fabric panels and luxurious touches, such as leather bound and stitched handrails. 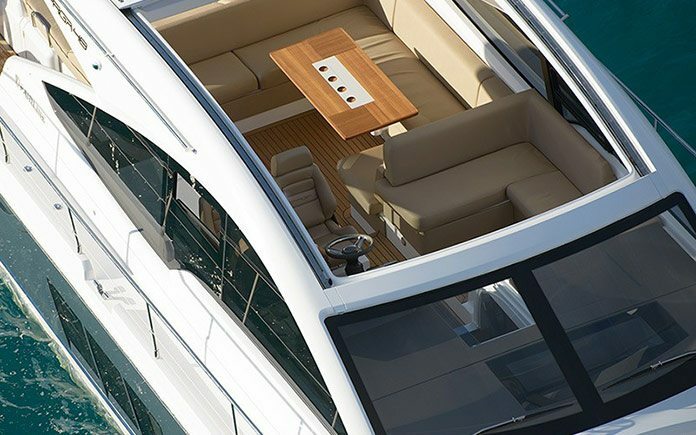 In its open form, with the canvas roof retracted, the Targa 48 OPEN offers a sense of freedom that continues out onto the cockpit with its large, inviting sunpad. Free-flowing sociable areas and large panoramic windows add to the sense of light and space in the generously well-appointed saloon. The new interior adds to this sense of freedom. There’s space, and lots of it. Beautifully considered sociable areas, luxurious and stunning in their simplicity. 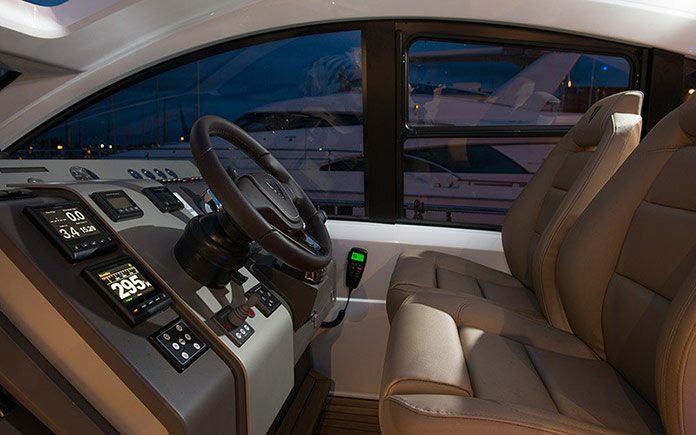 The cabin layout features a fabulous mid master with an optional sofa that converts into an additional bed, there’s a forward double cabin that can convert to a V-berth and the option of a third cabin in lieu of a dinette. 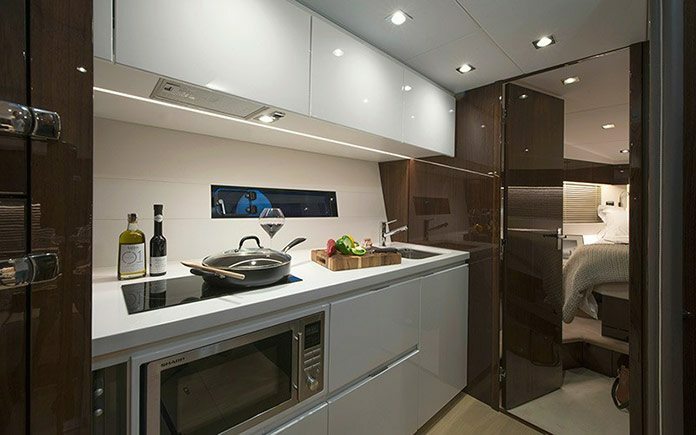 The perfectly formed galley enjoys a tall fridge/freezer and pull out larder. 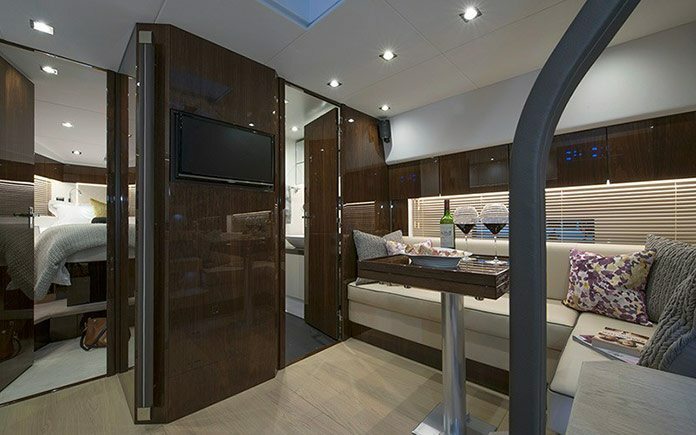 Large panoramic windows add to the sense of light and space in the generously well appointed saloon. Moving out onto the cockpit you can take a seat or stretch out on the large sunpad, with the luxury of being able to control how much sunlight you get by simply activating the powered retractable cockpit cover. 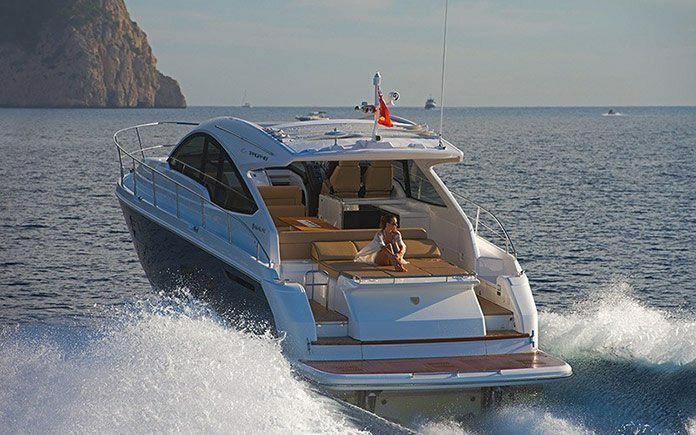 The integral garage is home for the optional jet tender and the option list extends to a hydraulic passerelle and a submersible powered bathing platform. 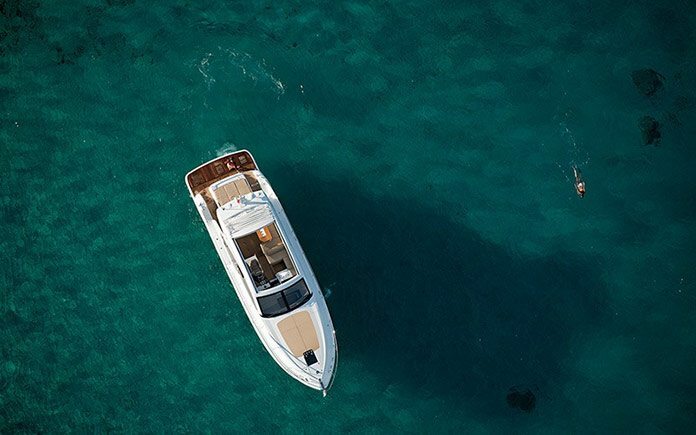 Add sparkling performance and exceptional manoeuvrability thanks to its Volvo Penta IPS with joystick control, and you have at your command one of the most exciting sports cruisers on the water. 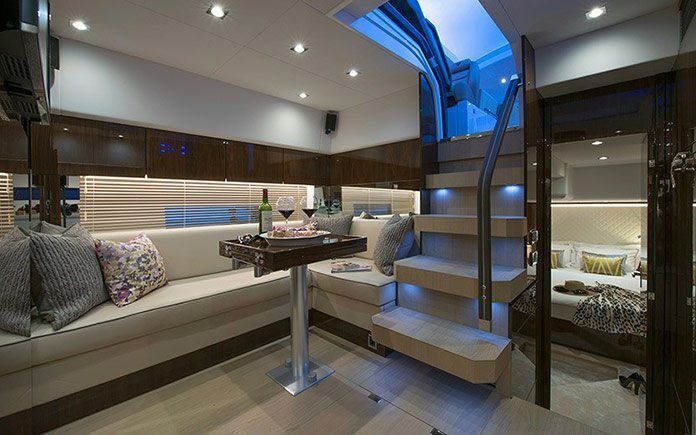 Fairline’s new interiors scheme was launched to great acclaim at the London Boat Show 2015. It features four design themes, Amalfi (mustard and teal), Capri (neutral), Hamptons (reds) and St Tropez (blues) each with its own distinctive colour palette. 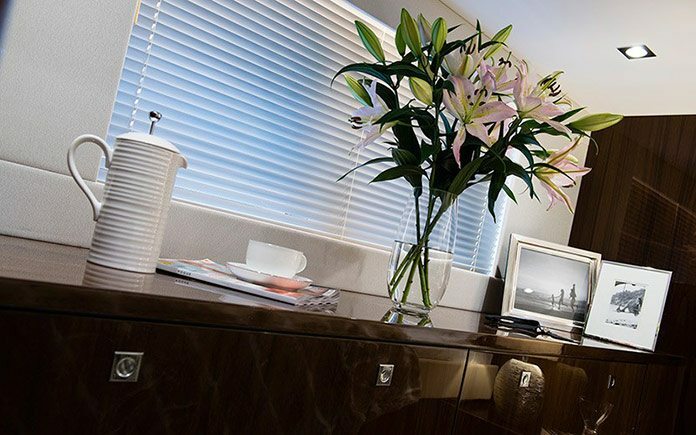 The colour schemes provide complete flexibility in a choice of fabric and surface finishes allowing for a wider personal expression of interior styling. 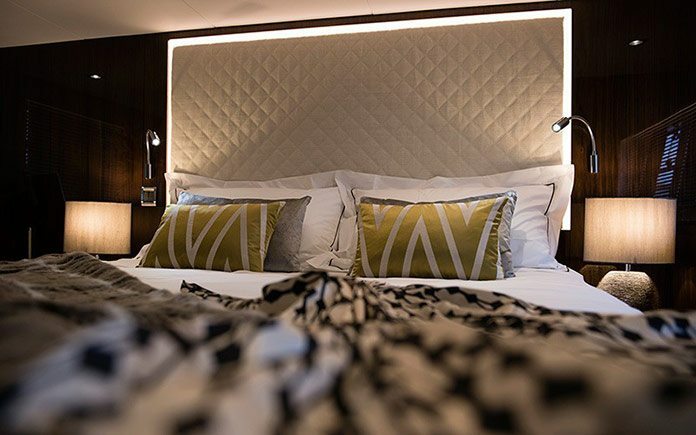 Fairline’s interior designer, Robyn Notley, adds, “The inspiration behind the four new ranges is to offer luxurious, bright, modern interiors that fully complement our range of luxury boats. 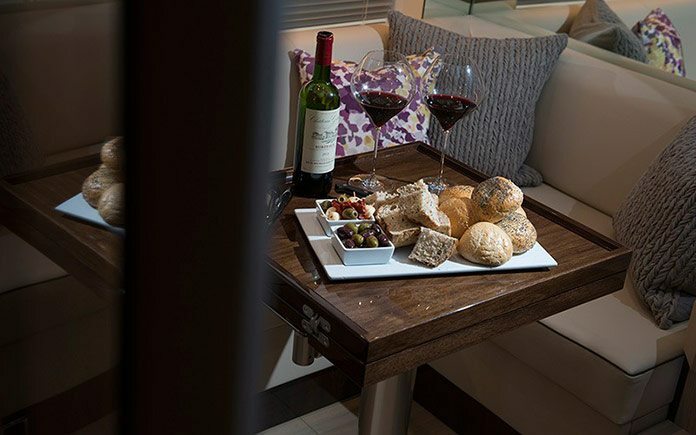 Following feedback from our customers that they wanted to make bolder interior choices, the myriad of options available within each range blend perfectly together, giving Fairline owners the confidence to make stylish choices in their interiors.